SARAH BRIGHTMAN: HYMN on PBS continues to air across the country and is receiving amazing reviews! 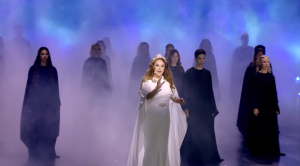 Filmed in the enchanting Ludwigs Festspielhaus at the foot of the Bavarian Alps in Germany, SARAH BRIGHTMAN: HYMN will continue to air on PBS stations across the US throughout November and December. This cinematic event is a hybrid of musical film, opera and concert and features beloved favorites and selections from her beautiful new album, HYMN. Accompanied by her band, a 40-piece orchestra, a 50-voice choir and dancers, the special also includes stunning performances by guest artists including Japanese superstar Yoshiki, Vincent Niclo, Mario Frangoulis and Narcis Ianau. Air dates and times subject to change at the discretion of each station without notice, so check your local listing for all broadcast dates and times. More info here.